The Guardian newspaper rolled out a new Android app to the Google Play store today with some notable new features, including the ability to save articles for offline reading and some additional swipe-based shortcuts. News reader apps such as Pocket, Instapaper and Flipboard help users to discover new articles from their favorite publications, along with a refined, minimalist interface for reading them while they’re on the move. These users completely bypass the dedicated apps offered by traditional newspapers and as a result, avoid all of the adverts served up throughout the menus or individual article pages. The Guardian is hoping to bring Android users back to its app with a new ‘Save’ feature, which enables news aficionados to read an article later or keep it indefinitely. The newspaper says many of its readers still email links to themselves or try to remember headlines for when they’re using a desktop browser, so such an addition should be warmly welcomed. The action bar now includes a bookmark icon, which when tapped saves the article to a new section at the bottom of the home screen. Likewise, selecting the new ‘Save Page’ option from the article menu will have the same effect. 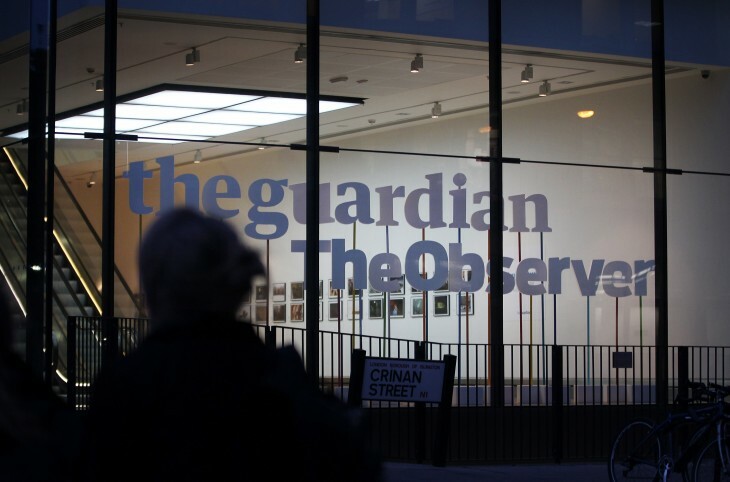 All articles are available offline and the newspaper says it hopes to sync these articles across multiple devices using the reader’s Guardian account in the future. The app has also been updated today with some new swipe gestures to help readers move between articles quickly and intuitively. Readers can now pull up with a single finger from the bottom of the article to reveal the next piece in the current section. It works the other way too, with a swipe from the top revealing the previous story. For longer features however, frantically flicking back to the top of the screen can be painful. To streamline the process, the app also supports a two finger swipe in either direction to move between the subsequent or previous article. It’s an ingenious way of quickly scanning the latest news, simply by reading the opening few paragraphs, pulling down with two fingers and repeating the process. Readers also have the option to swipe left for user comments, or right for related content within any article. 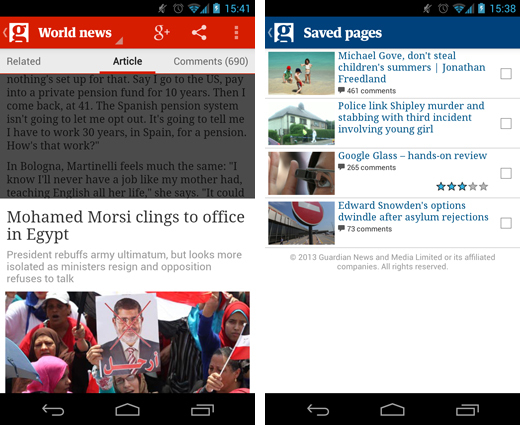 The Guardian is also altering the way it serves up adverts throughout the Android app by shifting them in-stream. Before adverts would reside permanently at the bottom of the screen, prone to an accidental tap when browsing, so here’s hoping this small change will alleviate the problem.